Hello Lovelies! 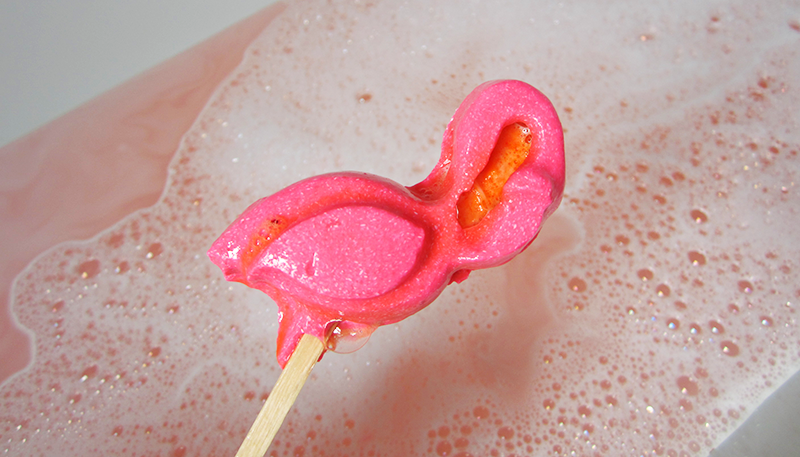 Today it's another Oxford Street Exclusive Lush review, and this time it's the reusable Pink Flamingo Bubble Bar (£5.95). I actually bought this on my first visit (on the day the store opened) and I can remember how excited I was when I spotted this. The little girl inside of me fell in love instantly, and it was actually the first product to make it into my basket. As you can probably imagine it was a bit of a surprise as reusable bubble bars usually last four-five baths, and I'm probably going to struggle with salvaging these pieces together for many more. 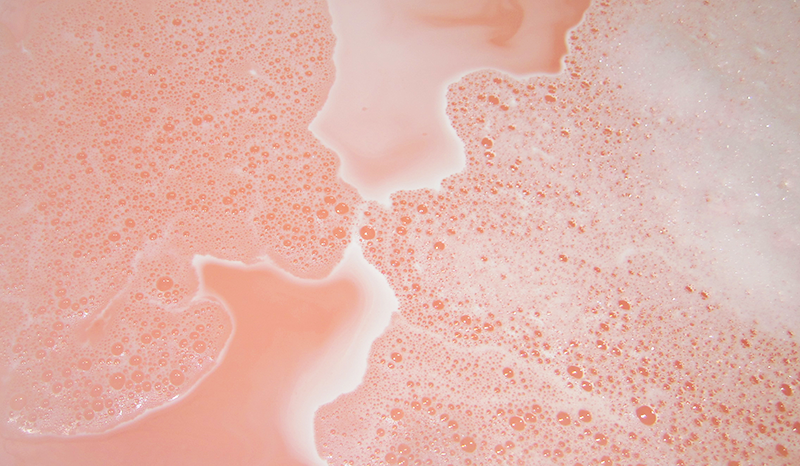 This seems like another case of Lush releasing a product too quickly, and not noticing its flaws - just like with Lava Lamp which currently isn't in Oxford Street as its being remade (it stains your bath). 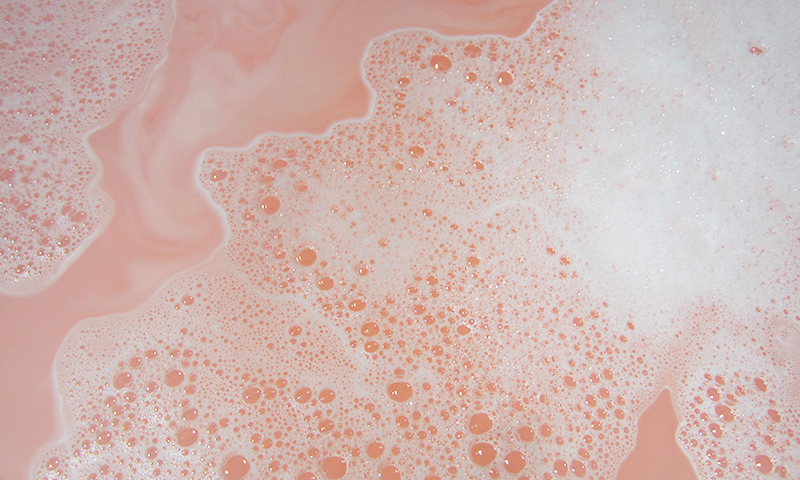 On the plus side, I got to see what the inside of this bubble bar was like, including its sort of orange bath bomb centre that seeps out wonderfully when you're using the bubble bar to create a lovely orangey pink colour. Now on to how this makes your bath, which is definitely more of a positive. If you love a nice girly bath, then you will love this. As said before the colour is so pretty, and is such a nice peachy colour that it really makes you smile. Fragrance wise, its not as strong as I'd like but its still there enough that you can smell it. Where this bath was a little disappointing was in the water itself as I felt it wasn't as silky smooth as many of the other bubble bars have made my water, and I didn't really leave the bath feeling any more moisturised or smelling of the fragrance. 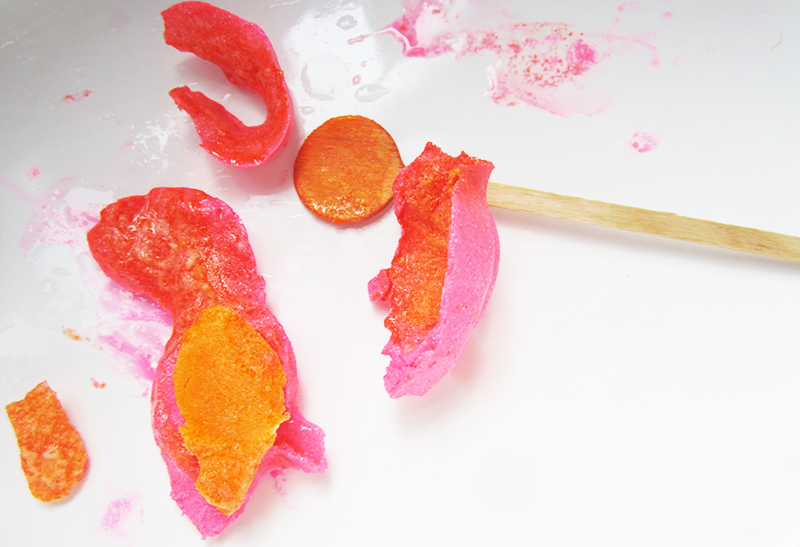 As you can see I've definitely had mixed feelings about this reusable bubble bar. I love the scent, and the concept (especially the bath bomb in the middle) but I feel like Lush need to make some adjustments on this one - and possibly lower the price a little as I feel like you don't get as many baths out of this as your standard Lush reusable bubble bar. Thank you for reading lovelies! 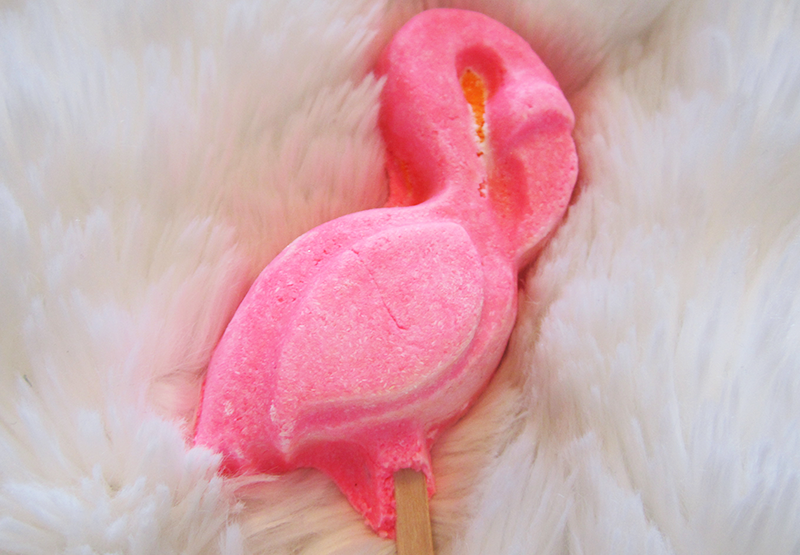 What do you think of the Pink Flamingo Bubble Bar? Hmm, definitely not as good as most of Lush bubble bars. I really, really need to start pestering my husband to make another trip to the next city so I can stock up on Lush and The Body Shop but so far he's been really hesitant because I usually go shipping crazy whenever we are there. Haha, do I'd love to see a Lush review on your blog! But yeah every time I go into lush I spend way too much! This looks so cool! It's a shame that it broke though and the smell wasn't too strong. Yeah such a shame, I guess I always have really high expectations with Lush though! Yeah it looks so nice, like I say I might be able to get a couple more baths out of it, fingers crossed! Have not tried this, but now I must. 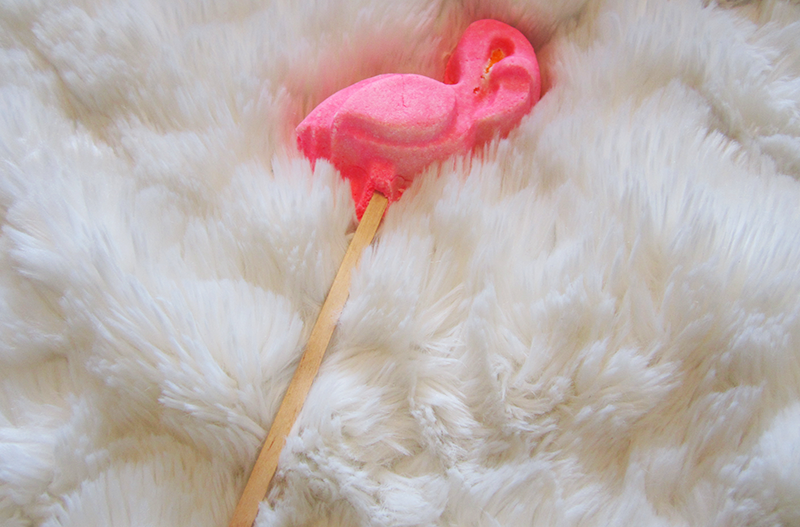 It's so cute :) Lush has the best bath stuff! Such a shame it falls apart, as it sounds like it smells good - hopefully they'll fix it up so it fulfils its potential! What a cute bubble bar. The scent sounds like it would be amazing but it's such a shame that it broke! I had a similar experience with the Northern Lights bath bomb.. or bubble bar.. I can't remember which one, I think bath bomb, anyway, by the time I'd got it home it had smashed to smithereens due to the shape, and a little digging around online led me to believe I wasn't the only one who'd had trouble with it. Annoying. This is so cute! I love lush! This looks so cute. It is pretty sad about the malfunctions with it. Hopefully they'll fix it right up! I’ve had my bubble bar for a year now and I forgot to use it lol. Do u think it should still be okay?